We all have times when our effectiveness increases and times when it fades This happens in every area of life, including sports, the arts, family or spiritual life, and in business. One day things are going great, and the next, nothing seems right. No matter what your sport, business or hobby, our ability seems to ebb and flow. If you’re a golfer, for example, have you ever had a really bad day where there appears to be an invisible repellent around the hole? No matter how hard you try, it seems, the ball goes the wrong way and get’s lost. It can happen to a successful salesperson, who suddenly goes weeks without making a sale; or to a writer whose mind goes blank and the word’s just won’t come anymore. We’ve all had this experience. What do you do? How do you get out of a slump? The process is simple: get back to basics. How did you become a great golfer, writer, sales person, or entrepreneur in the first place? Wasn’t it by learning and focusing on the fundamentals, then building on this solid foundation? Unfortunately, as we become more and more successful, we sometimes forget the basics–we ignore the fundamentals. This causes the breakdown in our performance which results in a slump. We all know what it means to get back to basics. 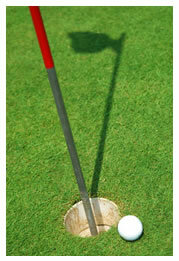 For a golfer, it might mean to keep your eye on the ball and to pay attention to your swing. For the sales professional, it may mean a renewed focus on basic principles such as consistent prospecting, listening with empathy, and closing with conviction. For an author, it may be regular reading and study. Whatever your profession, whatever your sport or activity, the key to consistent success is to stick with the basics. It is when we become complacent and forget the basic fundamentals that we fall into a slump. Success Tip: If you feel yourself falling into a slump, get back to basics. Focus on the fundamental skills and actions that helped you become successful in the first place.